NCASS – Northern Chartered Accountant’ Students’ Society was pleased to raise funds for the Sir Bobby Robson Foundation. The 2015 Newcastle NCASS ball in March raised a very healthy and now finalised sum of £1,029.16 from the sale of raffle tickets, providing the opportunity of winning some excellent prizes kindly donated by local businesses and societies. 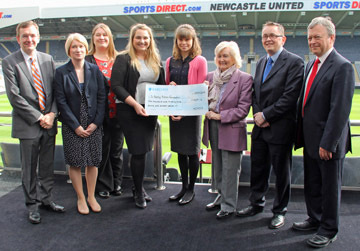 The chosen recipient of the monies was the Sir Bobby Robson Foundation cancer charity and it was entirely fitting that the cheque was formally handed over to Sir Bobby’s wife, Lady Elsie, and Liz Luff of the charity, at St James’ Park, home of Newcastle United where Sir Bobby was manager for 5 years. Pictured (from l to r) are Andrew Jackson (NorSCA President), Joanne Lucking (ICAEW), Ellen Arkless (NCASS), Laura Ireland (NCASS), Charlotte Christie (NCASS), Lady Elsie Robson, Chris Soan (NCASS President) and Keith Proudfoot (ICAEW). The Sir Bobby Robson Foundation was set up seven years ago to support cancer patients from across the North East and Cumbria and plays a significant role in the international fight against the disease. The charity recently announced a new fundraising total of £8 million, a target to which our donation will help the charity get nearer. An article about the evening can be found here.